You can rent our entire lodge (16 rooms) and have your wedding in royal style – have your family stay overnight and enjoy time together. What are weddings if not for the time you spend with your family? You must plan months ahead so we can block the rooms for your special occasion. We also have a relationship with a caterer who can provide dinner and lunch. Package available dates: November 1st to to April 30th, excluding long weekends, Christmas and Thanksgiving holidays. 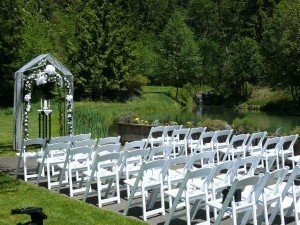 We do not offer wedding packages as the rooms get booked way ahead. The building and premises are not available summer weddings as well. We offer elopement packages between November to April (excluding long weekends, Christmas and Thanksgiving holidays). We are the destination for Elopements in Seattle, Tacoma, and Olympia metro area. Due to busy nature of summer, we only offer elopement venue during the period of November and April.